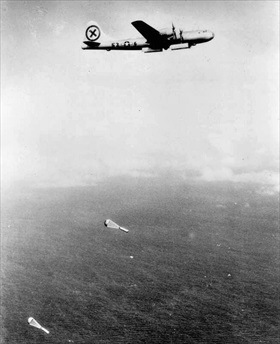 On this date and the next in 1945, less than four months after the start of the joint U.S. air and naval effort to strangle Japa­nese mari­time traf­fic by the aerial mining of Japan’s har­bors and straits, aptly named Opera­tion Star­va­tion, Navy air groups destroyed over half the train ferries between the north­ern Japa­nese island of Hok­kaido and the main island of Honshū. The largest, most populated of the Home Islands, Honshū was the center of Japan’s indus­try and the site of most of the coun­try’s rail lines. Almost over­night the amount of Hok­kaido coal delivered to Honshū fac­tories dropped more than 80 per­cent, seriously crippling Japanese industry. Left: Beginning on March 27, 1945, B‑29s assigned to Opera­tion Star­va­tion dropped 1,000 para­chute-retarded influ­ence mines with mag­netic and acous­tic exploders. The initial sortie was followed up by 1,528 more. Some models of mines had water-pres­sure-dis­place­ment exploders. 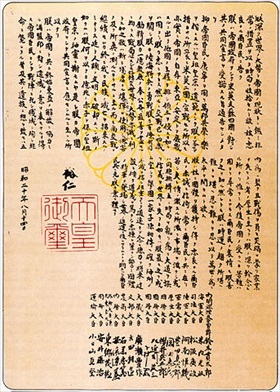 Aerial mining proved the most effi­cient means of destroying Japa­nese shipping during the war. In terms of damage per unit of cost, it sur­passed the stra­tegic bombing and the U.S. submarine campaigns. 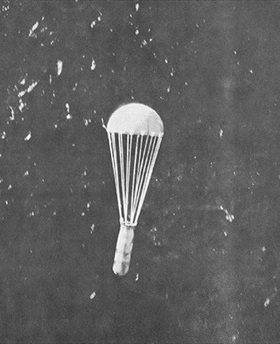 Right: A 1,000 lb M26 sea mine being dropped by a B‑29, 1945. The Twen­tieth Air Force laid 12,135 mines in 26 fields on 46 sep­a­rate mis­sions. Even­tually most of the major ports and straits of Japan were repeatedly mined, severely dis­rupting Japa­nese logis­tics and troop move­ments for the remainder of the war. The mines sank or damaged 670 ships totaling more than 1,250,000 tons. 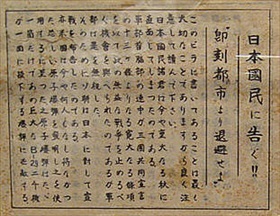 Right: A leaflet dropped from a B-29 on Japan after the bombing of Hiro­shima. Trans­la­tion: Notice to the Japa­nese People! Evacu­ate the city immedi­ately. What this leaf­let con­tains is ex­tremely im­por­tant, so please read care­fully. The Japa­nese peo­ple are facing an ex­tremely im­port­ant autumn. Your mili­tary leaders were pre­sented with thir­teen articles for sur­render by our three-coun­try alli­ance to put an end to this unprof­it­able war. [The refer­ence here was to the Pots­dam Declara­tion issued by the U.S., Great Britain, and Nation­alist China on July 26, 1945.] This pro­posal was ignored by your army leaders. Because of this the Soviet Republic inter­vened. In addi­tion, the United States has devel­oped an atom bomb, which had not been done by any nation before. It has been deter­mined to em­ploy this fright­ening bomb. One atom bomb has the destruc­tive power of 2000 B‑29s. This fright­ening fact should be under­stood by you by observing what kind of situ­a­tion was caused when only one was dropped on Hiroshima.